Tamaño de esta previsualización PNG del archivo SVG: 320 × 320 pixels. Atras resolucions: 480 × 480 pixels | 600 × 600 pixels | 768 × 768 pixels | 1024 × 1024 pixels. Deutsch: Die Nationalflagge der Schweiz. Français : Le drapeau suisse. العربية: العلم القومي لدولة سويسرا. English: The national flag of Switzerland. Español: La bandera de Suiza. Nederlands: De vlag van Zwitserland. Português: A bandeira da Suíça. Tiếng Việt: Quốc kỳ Thụy Sỹ. Esta es una imagen retocada, lo que significa que ha sido alterada digitalmente de su versión original. Modificaciones: Renamed. La original se puede ver aquí: Flag of Switzerland.svg. 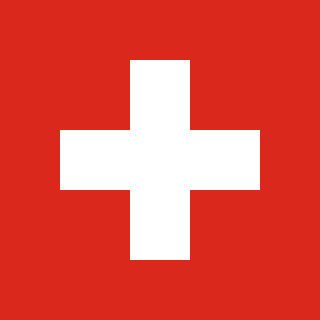 2010-02-16T05:20:43Z Reisio 320x320 (280 Bytes) we don't work for the swiss government / aren't we trying to represent _real_ flags? 2010-02-15T20:33:55Z Zscout370 320x320 (277 Bytes) I received another copy of the Swiss Government design manual; they stated for online use, the arms and flag must be #ff0000. 2009-04-20T16:42:31Z Wrightbus 300x300 (554 Bytes) Fixed "No Character encoding declared at document level"
2008-11-25T06:36:08Z Fibonacci 300x300 (533 Bytes) Simplified code. 2005-12-16T07:18:28Z Zscout370 250x250 (1631 Bytes) I cloned the cross, no other changes. 2005-10-15T00:10:20Z Zscout370 300x300 (1187 Bytes) The Swiss Consul in Los Angeles, California sent me a package containing information about the flag. While they have not said anything about the color shades, I am going use R 246, G 0, B 39.